TRU's Rhiannon Garth Jones reacts to Wales' recent Six Nations squad announcement, assesses their chances in the Championships and takes a look towards the Rugby World Cup in Japan. All the teams competing in this year’s tournament will be keeping an eye on the Rugby World Cup, using the pressure of what are the closest thing to knockout games to see which players and combinations can be relied upon. Gatland’s selection, though, gives quite a clear indication of what his 31-man RWC squad will be, give or take a few positional debates and final spots. There won’t be many surprises from here on out. This is a young squad: the average age is 26 years old and the average number of caps is 29 (a figure pulled up slightly by Alun-Wyn Jones’ impressive 119). Yet none of the players included are a shock. Almost all of them impressed at some point on the nine-match winning streak of last year; the two who didn’t (Josh Turnbull and Thomas Young) have been performing at a consistently high standard for years. Aaron Wainwright, for instance, only has two caps yet his performance as an early replacement against South Africa was so assured that few people would be concerned at him starting at 6 in France. Young also has only two caps, both from the summer tour 18 months ago while the senior players were away with the Lions, but he has been one of the best opensides in the Gallagher Premiership for some time. Josh Adams has a grand total of five caps, but almost feels like a settled member of the squad. The list goes on. Necessity has meant that many of these players have been around for a while – Tomas Francis and Samson Lee are both 26 but went to the last World Cup. Hallam Amos, aged 24, did likewise. George North, of course, has 78 caps and two Lions tours for his 26 years of age. But Gatland and his team have done excellent work in integrating other young players such as Leon Brown, Seb Davies and Owen Watkin (22) as well as Adam Beard and Dillon Lewis (23), into the squad so that it feels seamless. Many of these youngsters (Lewis, Wainwright, Watkin) were trusted to see out the game against South Africa in November and did so comfortably, while Beard and Adams started. They’re good enough so they’re old enough. A lot depends on how Gatland balances his 31-man squad for the RWC: will he take five props or six? Two hookers or three? How many back-rowers? But add Taulupe Faletau to this squad, who was withdrawn last minute because of injury plus the injured Ellis Jenkins, and you can predict quite closely what Wales’ first-choice, injury-permitting squad would be in September. For instance, a number of players, such as Beard, Dan Biggar, Brown, Leigh Halfpenny, Ross Moriarty, Rhys Patchell, and Nicky Smith, are included despite their fitness. 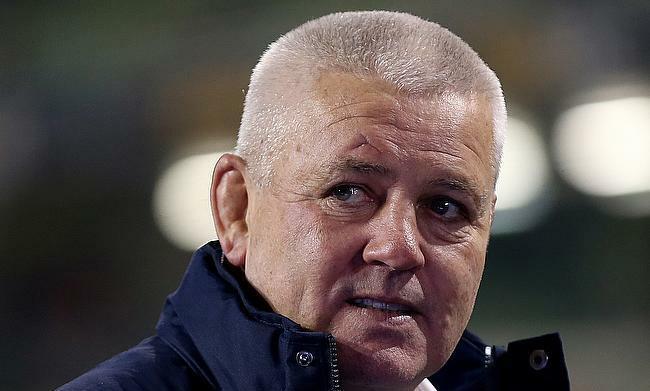 Gatland wants to use this time to prepare his squad, even if they can’t play yet. Brown and Lewis look to be fighting it out for the third tighthead position and will probably be competing with Wyn Jones for the last prop spot if only five are chosen. Seb Davies and Turnbull are probably competing for the utility back-five position. Wainwright and Young will get the chance to prove their worth if Jenkins doesn’t recover from his ACL injury in time. Josh Navidi’s ability to play across the back-row may well be demonstrated if Moriarty isn’t fit to play the opening rounds. Gatland said Jarrod Evans has been included because both Biggar and Patchell are recovering from injuries. His selection suggests he continues to be ahead of Sam Davies and Rhys Priestland in the pecking order at 10 but, given Biggar’s experience and the ability of both Anscombe and Patchell to cover 15, he’s unlikely to break through further at this point. Watkin has taken his chances well and could possibly be just ahead of Scott Williams in the centre options, although the latter’s 57 caps and two World Cups will likely count for much as he completes his return from injury. Lastly, Amos, Adams, and Steff Evans (perhaps the closest thing to a surprise in this squad, given how little gametime he’s had for Scarlets) would seem to be competing to join Liam Williams, Halfpenny and North in the backs. Jonah Holmes gets another chance to prove he’s a bolter but he will have to shine very bright indeed to make his case. Leigh Halfpenny, Liam Williams, George North, + one of Josh Adams / Hallam Amos / Steff Evans. Obviously, an ‘injury-free squad’ isn’t likely to happen and, equally obviously, some current ‘fringe players’ might excel and force their way into contention. We might even see Rhys Webb finding his way back to contention. But the very fact that we can see the shape so clearly shows how well Gatland is preparing Wales for this third and final RWC under his stewardship. Can they win the Six Nations? The Guinness Six Nations is a notoriously tough competition and this year will be no exception. Ireland, Wales, and England are ranked second, third, and fourth in the world, respectively. Scotland have the strongest side in a generation, Italy have improved leaps and bounds, and, while France can be frustrating, they have a huge amount of talent. Given that France lost at home to Fiji in the autumn, Wales will believe they can get that important start and follow it up with a win over Italy in Rome (a result that is less assured these days but well within this squad’s ability). After that things really heat up. England at home might be the most interesting fixture, as Gatland has never beaten the Red Rose whilst Eddie Jones’ as being in charge despite their slump in the last tournament. That is a scalp he and his team will be craving. Scotland at Murrayfield follows, where both teams will want to reverse recent humiliations at the hands of the other. Then, finally, Wales meet Ireland in Cardiff. Wales have been something of a bogey team for Ireland under Gatland, rarely losing at home and, while nobody in the camp will be underestimating this Ireland side, if they go into that final match in Cardiff with a chance of taking the title, all bets are off. Clinical finishing and good defending tend to win teams the title in the Six Nations, two areas in which this Wales team have proved their worth. In addition, their coterie of breakdown operators is likely to prove extremely helpful. Possibly only Ireland could lose players as talented as Faletau, James Davies, Dan Lydiate, and Aaron Shingler, after the retirement of Sam Warburton, and still look healthy in the back-row. The bookies currently prefer Ireland and England to Wales, which Gatland will be fine with – he and his squad enjoy going under the radar. They have been doing so for a while now. But, in what could be the tightest Six Nations in years, this quietly impressive young Wales squad could do very well indeed. If they do, they are considerably less likely to remain under the radar.